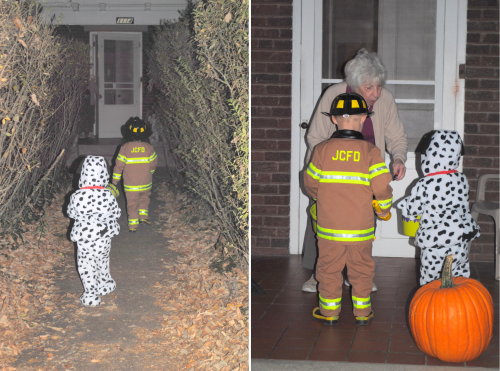 Can not believe that I forgot to post about the boy's Halloween. Let me first say that my kids were the cutest on the block ... ok, proud mamma here, and I am allowed to say that. Every year I struggle with the kids costumes ... what will they be, will they wear it, are they going to be too cold, etc. This year was no different. Let me backtrack ... My son Braeden is obsessed with super heroes ... something I really despise. So it wasn't a hard decision for me to ban them in our household after he started acting them out, and having trouble at school. 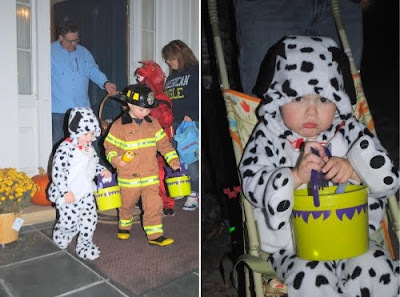 That being said, did anyone happen to notice the trend in kid costumes this year? ALL SUPER HEROES ... are you kidding me? Where are the cute costumes for younger boys? Do they all really need to be fighting costumes? I was a little disgusted to be honest. And to be fair, I almost let Braeden be Spiderman this year, he saw the costumes everywhere and didn't understand why he couldn't dress up as him. But I stuck to it, and decided I would start talking up "real heroes." Yep, REAL heroes are the men and women who protect our country and community. Like Firemen, Policemen, Soldiers, etc. It caught on pretty quick and it was long after there school had "Fire" week where Braeden was talking up Fireman. "Stop, Drop & Roll!" So I ran with it. I found the BEST fireman costume online that was an exact replica of our community ... it was the bomb! 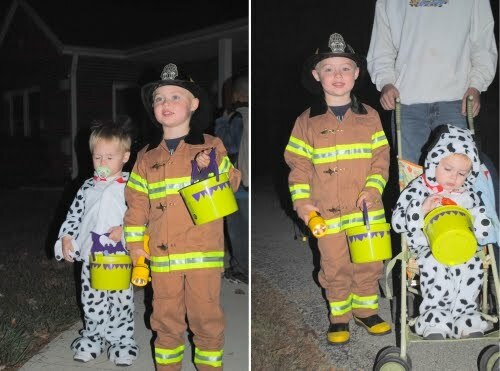 So there you have it ... for Halloween this year I got one handsome fireman and one cute puppy ... couldn't have worked out better! They had SUCH a fun time too. It took Bayler a little while this year to get used to his costume, he would put it on, but would want to take it right off. That was until he realized he got candy for wearing his costume ... I didn't think I would ever get it off of him! I can't tell you how many people stopped us either. They were the perfect combination. And the number of Fireman that wanted to buy Braeden's costume from me was unbelievable. I totally agree with you on the super hero costumes... REAL heroes are way better. 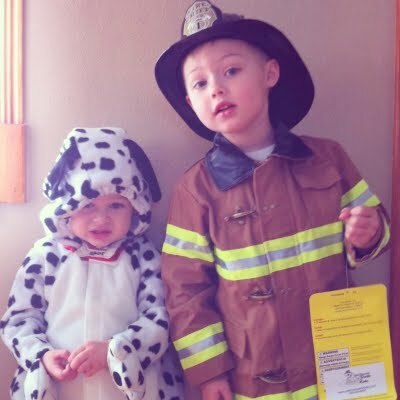 I thought about this theme with mine since my oldest has been into fire safety also thanks to school. Such a cute theme! !